There couldn’t be a better time for a great chili recipe than New Year’s Eve. Something to warm your belly before a night out in the cold is definitely in order. I looove soups, chilies, and stews and all their many forms and consistencies and while I am fond of soups during the winter months, I pretty much love soup all year. I love that I can cram a ton of veggies and flavors into it and come up with something healthy and amazing. It’s like the multivitamin of meals. I love that it always provides left-overs. And, it’s comfort food with built in anticipation that never disappoints. Perhaps my love of soup started with the witches brews I concocted as a child out in my mother’s garden. Who knows. Either way, I make and play around with soups quite a bit and every once in a while I make something really delicious. That was certainly the case with my experimental chili. I am a fan of Bill Philips and his philosophy on healthy eating and diet. I have been making meals out of his cook book for over a decade. One of my favorites is his chili recipe, but I think I just improved it. 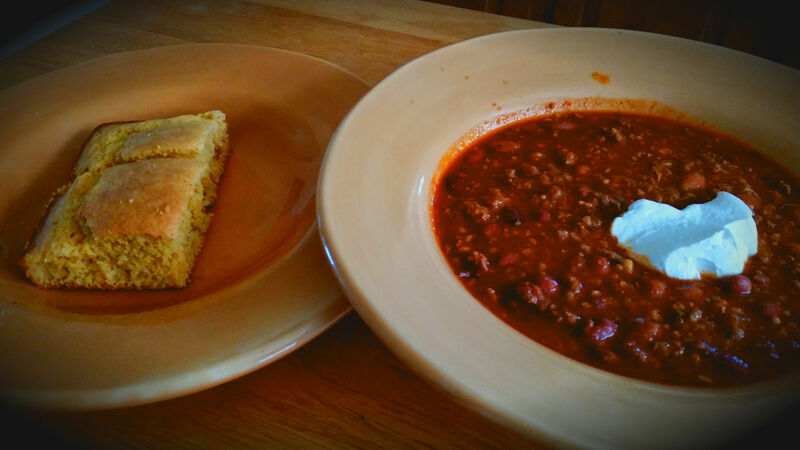 About a month ago I threw some cinnamon into that recipe and came up with a chili more scrumptious than any I have ever tasted (if you have already discovered the amazing quality cinnamon adds to chili don’t burst my bubble). And if the flavor is not great enough, the mouth watering scent that bubbles up out of the chili while you are cooking is worth it alone. The way that I prepare the chili is not set in stone, but if you follow my lead, it will be a little thin the first day, so if you want that thick chili consistency, you might want to make it a day in advance and give it a night to settle and thicken up. Plus, if you do that, you will give the flavors time to mature – as we all know that soup is better the second or third day. Feel free to use your choice of meat, no meat, or a meat alternative and any additional vegetables or spices as you desire – though you might want to try the recipe first before making alterations, or at least take notes so you remember that you can duplicate it. In a large pot over medium heat melt butter and stir in the onions. Cook for a few minutes and then add the garlic and beef. In a food processor add the can of tomatoes, the pepper, and the jalapenos and then add to the pot once the beef is browned. Then add all the rest of the ingredients. Let simmer for 30 minutes. And voila! Your cinnamon chili is done. Put a dollop of sour cream and some shredded cheese on top and enjoy. Posted on December 31, 2014, in Uncategorized and tagged Bill Phillips, Bill Phillips cook book, chili recipe, comfort food, cooking with cinnamon, Scrumptious Cinnamon Chili, soups for winter, the cat lady, the soup queen. Bookmark the permalink. Leave a comment.